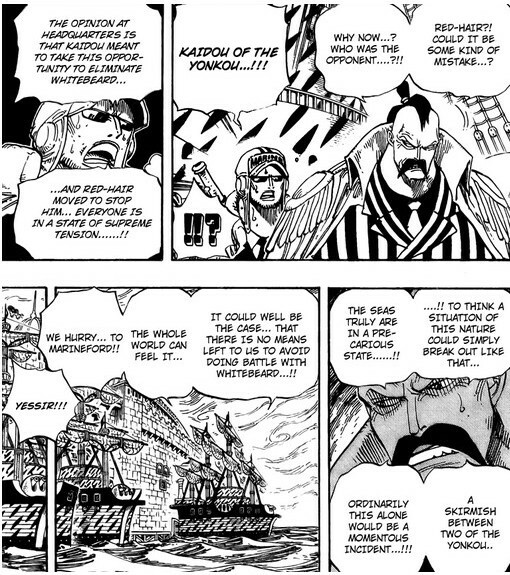 I dont know the exact timeline but a while before the Marinefold incident and the execution of Ace, it was stated that Shanks went ahead to battle Kaido "THE KING OF BEASTS"
Was the battle an "all-out war" between Kaido and shanks fleet? Or more of a 1v1 between the 2 Emperors. Also, since Shanks made it to Marinefold immediately after battling the King of Beasts, does that imply that Kido lost the fight? I'm really intrigued because the fact that Shanks showed up while Kaido didn't means that Shanks was able to prevent Kaido from running amok in Marinefold. Could this testament prove that Shanks is way stronger than Kaido? When Kaido tried to stop Whitebeard from going to Marineford, Shanks interfered and clashed with him in order to allow the other Yonko to rescue Ace. It is not known what happened during their encounter, but Shanks arrived at Marineford unharmed. Could this testament prove that Shanks is way stronger than Kaido? No one can say for sure since only Oda knows how it happened exactly, unless it will be revealed in a later chapter. But the fact that he arrived unharmed could imply it was more of a one-sided fight that was probably not worth mentioning. What happened in the fight between Zoro and Monet? What happened during the Void Century and the name of the KINGDOM? Why was the straw hat passed to Shanks and then to Luffy? What is Shanks' sword made of? What are the similarities between Gol D. Roger and Monkey D. Luffy? Are they related by blood? What are their relatives' ages? What is the conflict between Sea and Devil Fruit? What is the difference between Haki and Conquerors haki? What was the relationship between Whitebeard and Roger?